Zagg is most known for its invisibleSHIELD protectors for devices. However, the company has branched off into other categories like headphones and on-the-go charging. 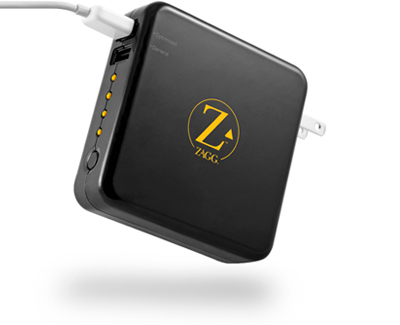 We got our hands on a ZAGGsparq 2.0 on-the-go charger to review on the site. This small black rectangular box allows you to carry four complete recharges for most power-hungry smartphones, with a 6,000 mAh Lithium Polymer battery. In fact, you can charge almost anything that has a USB charger, so it isn’t limited to just smartphones. There are two USB ports, one optimized port and one general port. Keep in mind that if you are charing something like an iPad, it will take your battery from 0% to 60% but will not give you four complete recharges like it will on smartphones. I’ve been using the ZAGGsparq for about two months now. I can confidently say that I rarely leave home without it. It is just so convenient being able to charge all of our devices on the go. Sure, I am not your typical consumer. I carry around two iPhones, two iPads, a bluetooth, and an occasional phone to review. Needless to say, two USBs on the ZAGGsparq 2.0 comes in handy when the battery gets low on one of our devices. Now, you might be thinking that it is probably an inconvenience to recharge the ZAGGsparq 2.0 when it gets to that time. But you’d be wrong. All you need to go is pull out the prongs and plug the unit straight into the wall. Once charging devices, you can see how much power you have left using the four yellow lights on the side of the unit. The lights represent 100% – 75% – 50% – 25%. The ZAGGsparq 2.0 can be purchased from Zagg’s website for $99.99.